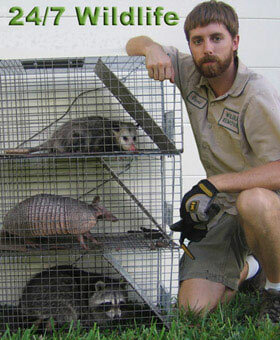 Expel Wildlife Solutions: My name is Kyle, and I operate in Gainesville, FL and specialize in nuisance wildlife control. If you need mouse or rat control in Gainesville, we offer a complete solution with full guarantee on our work. We commonly deal with problems such as raccoons in attics, squirrels in the ceiling, rats in the walls, snake removal and control, bat control, and more. We are the best Gainesville extermination company available when it comes to wild animals. All of our wildlife trapping is performed in a humane manner. We never intend to harm any wildlife only to safely and permanently remove it from your home or business. Once animals are caught, we quickly arrive in Gainesville to remove the animal, and relocate it approximately 30 miles outside of the Greater Gainesville area. We service Gainesville and Alachua County, as well as Ocala and Marion County Florida. We take pride in operating as a small, owner-operated company within Gainesville, and we stand by our work. If you need animal trapping services in Gainesville or any part of Alachua County or Marion County, give us a call, and we will be happy to assist you. We specialize in both residential and commercial services, and accept all major credit cards. There is no free wild animal removal service in Gainesville, but we will provide a professional service at a fair price. Hey Expel Wildlife Solutions, i really appreciate your web site i used it recently to figure out what to do with squirrels that were entering my roof line. it’s not my attic but rather small roof above my picture window. (3' x 8'). i hired your recommended guys from your directory in the Gainesville area. He set traps and as he was setting traps and the exclusion cone on the entrance ( under soffit above gutter on the corner) a squirrel jumped on the roof and tried to fight to get into the hole. He shooed him away where the squirrell got trapped and removed that night. next morning another squirrell got trapped as i heard the trap snap. but now on day 2 I saw a baby squirrel or very young one trying to get out only to turn back down the exclusion tube and never fully jumped out. i think the problem is i live on second floor and the tree that gave them the original access is just out of reach to jump out and never come back in. now i know there is at least two babies up there i wondering if they will ever jump out or will they chew through the ceiling and land in my living room, or do they chew another way out. I’m terrified they are going to chew down to me or never get out. Thanks for any advice on this dilemma -Mike You'll just have to wait and see if the young come out, but I think they will. I don't think they'll chew their way into your house.